One Sentence: Fireworks will from now on be know as sky flowers. Zombies! Zombies that think! Zombies that use tools! Zombies!!!!!! Well if I were to comapre this movie to Day of the Dead…it would be miles ahead. This movie is 1000 times better than that piece of crap. But I think it should stand alone, I meant that movie is 20 years old. 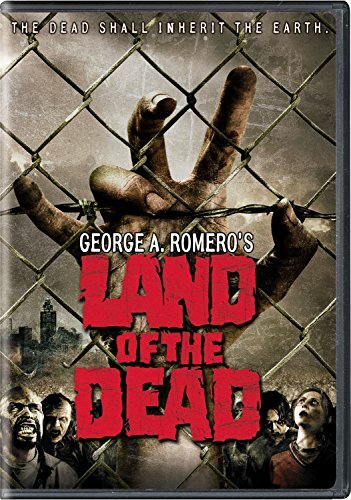 This is a new generation, with new zombie movies to compete with, including a remake of Dawn of the Dead, so how did Land of the Dead, part 4 of the original Zombie master's series. Ok I guess. Who doesn't want to be in a Zombie movie, or spend money on one? With the recent hugeness of Shawn, and Dawn, and 28 days, I think you would line up a ton of money and cast for this big to do. But it just didn't pan out that way. It was mostly filled with unknowns with acting on par with the rest of the series, and a pretty cheap budget. Dennis Hopper and John Leguizmo were the only people I knew in it. We are continuning the story from Day of the Dead, where zombies are learning to think and use tools. They are becomming more "human." The last haman city on earth is protected on all sides from the zombies, or is it?!?! This is again a look at humans and thier failure as a society to work together to solve a common issue, instead to fall apart and cause destruction of the whole group. So the plot was ok, nothing amazing, you expected what was going to happen to happen, and it wasn't very exciting or scary really. But there were zombies, and gore and a lot of blood and eating of the people and such. I would rent it if your into the zombies, but it wasn't as good as the others that have come out in the last bit, excpet for House of the dead, that movie sucked balls.